New coaches, please lot onto Net Generation and as you register, you will be directed to the SafePlay process. Please allocate about 45 minutes to complete the process, which includes an informative and educational video along with a questionnaire. Coaches will receive a renewal notice in advance of their expiration date. Coaches will log into their Net Generation account and click on "Welcome" and then "Provider Information" to find the Safe Play renewal link under the Safe Play Certification heading. 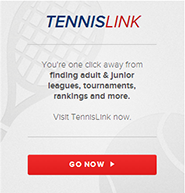 Click here for information pertaining to team composition, match format, scoring format, ball type, and racquet length.